By Robert Farley, Angie Drobnic Holan, Louis Jacobson on Monday, January 17th, 2011 at 6:30 p.m.
Our Obameter shows 133 promises Kept and 33 Broken. 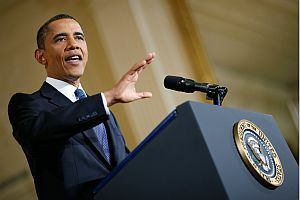 As a candidate, Barack Obama vowed to fix the "broken politics in Washington," reinvigorate government and restore the nation’s reputation overseas. PolitiFact has been tracking more than 500 promises Obama made during the 2008 campaign, everything from "Create new financial regulations" (Promise Kept) to "End income tax for seniors earning less than $50,000" (Promise Broken). Individually and collectively, our Obameter ratings tell the story of his presidency at the halfway point in his four-year term. Measured in raw numbers, the scorecard shows his overall performance, with 133 promises Kept and 33 Broken. The individual promises tell a more nuanced tale. We took a closer look at six of them that illustrate his successes, failures and the challenges ahead. Passage of the health care overhaul was the biggest policy accomplishment in Obama's first two years. The 906-page law made headway on three-dozen individual health care promises, including this broad one to expand coverage to everyone. Despite Democratic control of both houses of Congress, passing the bill wasn't easy. Obama and party leaders had to make significant compromises to win over nervous Democrats and neutralize opposition from the health care industry. Ultimately, the plan looked a lot like what Obama campaigned on: The private health insurance system stays in place, with new tax breaks for people who need help buying coverage and new regulations to protect consumers. It was his biggest policy victory, but its political dividends -- and the long-term prospects for the law -- remain uncertain. Republicans are trying to repeal the law in Congress and the courts, and the public is evenly split. That rough divide hasn't changed much since Obama signed the law in March, despite it being a major issue in the November elections. It will take four years to phase in all aspects of the big overhaul, which prolongs the debate. "This is somewhat unusual in American life that you pass a big bill and it only goes into effect four years later," said Robert Blendon, a Harvard University professor who studies public opinion on health care. "Right now, it's one expert arguing with another. How do we really know? This uncertainty is what keeps the political pot boiling." With Democrats controlling both houses of Congress for his first two years, Obama was able to fulfill many promises with pure partisan muscle. But now that Republicans have taken control of the House, he will be forced to compromise more. This promise, now rated Broken, illustrates his new reality. During a lame-duck session in November and December, Obama honed the art of the deal. He put together bipartisan support for some surprising victories on the repeal of Don't Ask Don't Tell and Senate ratification of the new START arms control treaty with Russia. His biggest compromise came on the delicate question of extending the Bush tax cuts. Obama got half a loaf -- a two-year extension of the tax cuts for the middle class, as he had promised, plus some payroll tax relief and an extension of unemployment benefits. But he had to sacrifice one of his signature promises: to repeal the Bush tax cuts for people making over $250,000. Those tax cuts were extended for another two years, so we rated the promise Broken. "I’m as opposed to the high-end tax cuts today as I’ve been for years," Obama said, adding that "we're going to keep on having this battle." That may be, but even as he keeps fighting, he seems willing to make some sacrifices. Without Iraq, Obama might never have won the Democratic nomination. He campaigned on his 2002 opposition to the war saying it showed judgment voters could trust. He vowed a "responsible, phased withdrawal." When he took office, there were about 142,000 troops in Iraq. Today, that number is about 47,000. Many were withdrawn in 2010, even as there were modest declines in violent incidents and civilian deaths, suggesting growing stability. At the end of the year -- after months of negotiations -- Iraqi leaders settled on a coalition government. In a sweeping year-end editorial, the Economist magazine noted that "Iraq, Iran and Arab-Israeli peace were big burning fires when (Obama) took office. All have since been contained, to some extent, and largely by American efforts. Indeed, if damage-control was the mission, Mr. Obama may claim a decent measure of success." Few analysts are suggesting anything more than cautious optimism when it comes to Iraq. But it is clearly becoming more stable, allowing Obama to focus more on his other big foreign policy challenges, particularly Afghanistan. New presidents start with a wallet full of political capital. But it can run out quickly. Such is the case with Obama's key immigration promise, to provide a path to citizenship for undocumented immigrants. In his first two years, he put so much emphasis on passing health care reform and the economic stimulus that when he tried to push immigration reform, cap and trade and several other initiatives, his wallet was empty. Obama acknowledged the bleak prospects in an April news conference. "Look, we’ve gone through a very tough year, and I’ve been working Congress pretty hard," Obama said. "So I know there may not be an appetite immediately to dive into another controversial issue." Now, immigration reform advocates fear their moment has passed. Republicans are more interested in border security. The DREAM Act, a bill that provided a path-to-citizenship for immigrants brought to the United States as children, fizzled during the lame duck session. Obama called it "maybe my biggest disappointment" of the lame duck session and said he remained committed to the goal. But with Republicans in charge of the House and Obama holding an empty wallet, the prospects look bleak. Democratic control of Congress in Obama's first two years enabled him to pass big bills to stimulate the economy and overhaul health care, but the narrow partisan votes were setbacks for his promise to bring the parties together and change the tone in Washington. Acrimony grew. But now that Republicans control the House, both parties need each other. That was evident in the lame duck session in November and December, when an unusual coalition of Republicans and Democrats passed an extension of the Bush tax cuts, repealed the Don't Ask-Don't Tell law and ratified a new START nuclear arms treaty with Russia. "Obama can no longer get away with the partisan nastiness of the past two years," said Grover Norquist, a Republican activist. "It will show through from time to time, but he will be forced to keep a public smile." Of course, the same goes for the Republicans. They'll need Democratic support to get their bills through the Senate and signed by Obama. The loud debates over health care and the economy overshadowed the quiet progress Obama made on this promise. And while the topic doesn't provide much fodder for cable news shout-fests, it's important: Progress means we're less likely to suffer a catastrophic nuclear attack. Obama brought leaders of 47 countries to Washington last April for a nuclear security summit and got each of them committed to securing all vulnerable nuclear material within four years. Some countries even volunteered to do more. Constant nudging by Secretary of State Hillary Clinton made progress with countries as diverse as Belarus and Kazakhstan. So far, the U.S. has prodded six countries to eliminate all materials capable of making nuclear weapons -- most recently, Serbia. Last month, the U.S. helped haul away 110 pounds of highly enriched uranium from Ukraine. In total, the U.S. has now secured or destroyed more than three tons of highly enriched uranium and plutonium -- enough to make more than 120 nuclear weapons, according to the National Nuclear Security Administration. The progress on this sleeper of a promise illustrates the importance of steady diplomacy. "This is basically the most important step that could be taken to keep nuclear weapons out of the hands of terrorists," said John Pike, director of globalsecurity.org. This promise doesn't stir up the blogosphere, but it's making the world safer.